Possibly the ship with the most colourful World War II history was HMAS Australia, fondly known as "The Aussie". The Aussie fought for almost the entire duration of the war. A county class cruiser commissioned in 1928 she was the second ship to bear the name of her country. 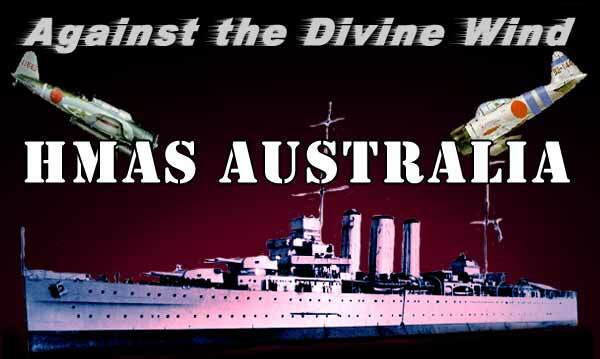 With the outbreak of WWII Aussie sailed for the Atlantic to begin her long wartime career that she was to fight on all fronts and against all enemies. She fought twice at Dakar in Senegal, closing right in under the fort's heavy guns and sinking a French destroyer. Bombers of the luftwaffe tried in vain to sink her whilst she was berthed alongside in Liverpool during the period when the city suffered its worst blitz. During her war service Aussie went everywhere - with the British Home Fleet in Scapa Flow, escorting the Atlantic and Indian Ocean convoys and around the coast of Australia searching for German raiders, cruising almost as far south as Antarctica. In December 1941 when Japan entered the war Aussie became the flagship or Rear Admiral Crace, followed by Admiral Crutchley and then Commodore Collins. In January 1942 the cruiser assisted in escorting the first US troops to Australia. Operating in the Coral Sea it pursued and attacked the Japanese from Guadalcanal to Hollandia, surviving everything its enemies could throw at her. Then in the closing stages of the war at the battle of Leyte Gulf in the Philippines Aussie encountered Japan's most secret and diabolical weapon. Anchored just off a bombardment point, late in 1944, Aussie received its first taste of a new weapon of warfare. Out of the blue skies of Leyte came the 'Divine Wind" or the Kamikaze. Japans suicidal attempt to stave off what was almost certain defeat in the pacific war. The first Kamikaze hit against Aussie was by a A6M5 Zero-Sen Fighter fitted with a 200 kilogram bomb, the impact of this snapped one leg of the ship's tripod mast, causing a huge shower of wreckage to rain down upon the compass platform. Underneath it lay Captain Dechaineaux mortally wounded along with many others, amongst them Commodore J. Collins, hero of the HMAS Sydney. Four days later, after the initial Kamikaze attack, Aussie again suffered the brunt of another, her sleek hull and distinctive row of three funnels drawing the suicidal pilots to her. It was perhaps the Japs new her identity and were determined to sink the Flagship of the Australian Fleet. After being badly mauled again she was forced to return to Manus Island, near New Guinea, to land 40 seriously wounded sailors and then proceed to Espirito Santu in the New Hebrides (now Vanuatu) to undergo repairs. HMAS Australia was needed badly by the R.A.N for she was the last surviving seaworthy member of the country's heavy cruiser fleet the rest having been sunk and Hobart badly damaged. So she was quickly returned to active service. She headed straight back to Philippine waters and on the afternoon of 5th January 1945 at the Lingayen Gulf landings the Kamikazes targeted her again. Her new Captain Armstrong flung the ship about wildly but it was to prove in vain as another bomb laden aircraft slammed into to her. The casualties were high - 25 men killed and 30 seriously wounded, most were badly needed guns crews. Despite extensive damage she joined HMAS Shropshire and other US units to aid in the bombardment of San Fernando and Poro Point. A new wave of Kamikazes then attacked, a Aichi 'Val' Dive Bomber surviving the murderous fire thrown up by all ships collided headlong into her upperdeck exploding in an enormous fireball. Several guns crews died instantly and a severe shockwave shuddered throughout the ship. This hit accounted for another 14 dead and 26 seriously wounded. by now Aussie's AA defences were all but eliminated. HMAS AUSTRLIA Returns from Philippines Campaign - Missing Fwd Funnel and other serious damage. At dawn on 8th January the allied fleet resumed its bombardment and the Kamikazes renewed their suicidal attacks. 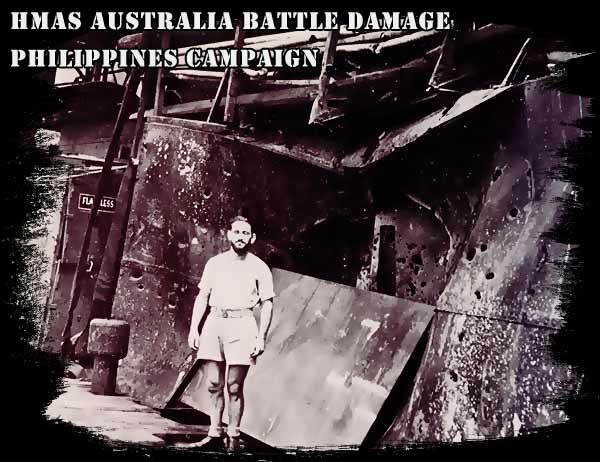 Aussie was the last ship in the line and was once again singled out by the Japs. A Mitsubishi 'Dinah' Bomber was shot down finally coming to rest just 20 metres from Aussie's hull. Moments later another bomber hurltled in, the Aussie's Gunners throwing up withering fire until at last shooting it down, but not before it released its bomb which exploded close to the waterline, punching a large hole in the hull. Taking a dangerous list to port another 'Dinah' roared in. Those guns still in operation tore the bomber to bits and it showered down aviation fuel upon the sailors whilst its massive engine smashed through the bulkhead of the Captain's Day Cabin. Within seconds another 'Dinah' roared in, the Aussie Gunners frantically trying to shoot it down, succeeding, within just 15 metres, the propellor blades embedding themselves in a liferaft. The aircraft skidding into the hull ripping another large hole and damaging yet another fuel tank, whilst two messdecks were completely destroyed. Aussie by now was in bad shape, her speed reduced to fifteen knots to avoid causing more damage. Aussie still hung in and managed to continue the fight with what was left of her brave guns crews. The following day the Japs decided to finish the Flagship off knowing she was almost dead in the water. As another plane raced in heading for her bridge its pilot misjudged his attack line and slammed into the yardarm slewing the aircraft around so as to miss the bridge area and taking out the top of the foremost funnel. Sliced off cleanly it crashed to the deck. There were no casualties from this hit but it spelt the end for Aussie. Two boilers had to be shut down because of insufficient updraft. Aussie's war had come to an end. For Aussie its days of combat were over, singled out by the Japanese Kamikazes she had defied the odds against the 'Devine Wind' and survived. Thus writing another page into Australia's proud Naval history.